Modern Music | The Brand New Modern Music Online Shop! 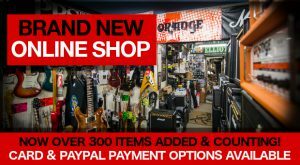 The Brand New Modern Music Online Shop! We are pleased to announce a brand new Modern Music Online Shop for our website. Our previous online store worked well for us, but with technology ever growing it started to fall behind and keeping it up to date took much more time. Our new Online Shop allows our customers to keep up to date with a selection of our latest products and special deals, which will also be available to view and purchase online via Card Payments or PayPal. Another major advantage is for our local customers to find something they like, get all the necessary information then pop into our store to try it out before a purchase. There is also a much simpler layout and separate categories for our customers to easily find what they are looking for. Our Online Shop is updated regularly, with over 250 products and counting. It will be regularly updated and connected via Blog posts on our website linking to product spotlights and special offers. We hope you enjoy browsing through the various categories and the full Online Shop can be found here.